Abducted Nationals Player Rescued In Venezuela Venezuelan officials say Wilson Ramos, found by police, is "safe and sound." Armed men seized Ramos at gunpoint Wednesday night outside his home in a working-class neighborhood in Valencia. Washington Nationals' catcher Wilson Ramos, center, talks to journalists at the Criminal Police headquarters in Valencia, Venezuela, Saturday. 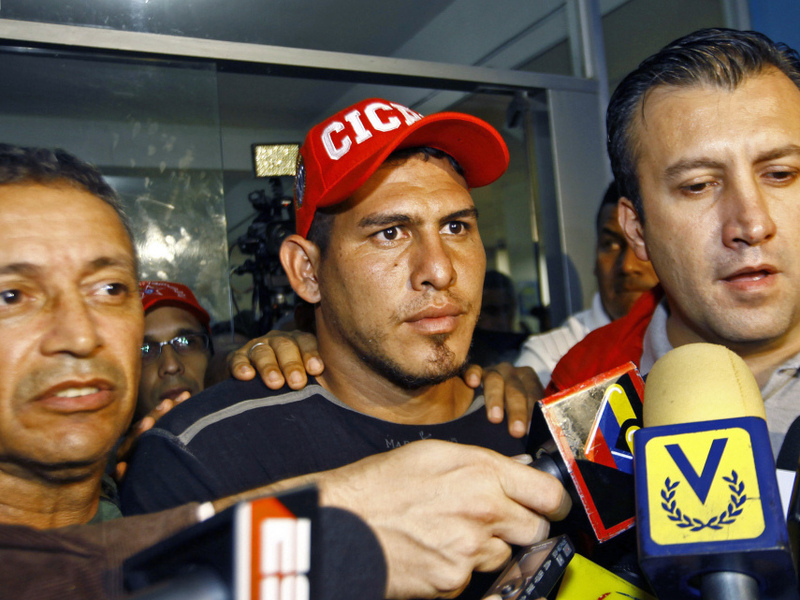 Venezuelan police commandos rescued Ramos Friday, two days after he was kidnapped. Update: Wilson Ramos has returned home and police have arrested five alleged abductors. Read our updated story. Venezuelan police rescued Washington Nationals catcher Wilson Ramos on Friday, two days after he was kidnapped, officials announced. Justice Minister Tareck El Aissami said on state television that 24-year-old Ramos was "safe and sound" and that he was rescued by police and National Guard commandos. He said three men were arrested in the kidnapping, but they were still searching for evidence where he was found "to see if we can find others who were responsible." It was unclear why he was released — or if a ransom was paid. Information Minister Andres Izarra initially announced the news on Twitter, saying: "The baseball player Ramos found alive by security forces in mountainous zone." Izarra said the operation had been authorized by President Hugo Chavez earlier Friday. El Aissami said Ramos would first undergo medical checks at the police statino and then be reunited with his family. The streets outside Ramos' home were jammed with well-wishers hoping to catch sight of the young ballplayer upon his return. Family, his siblings, cousins and others packed his small house. All were overjoyed upon being told that Ramos would soon be home after a 48-hour ordeal. Ramos' mother celebrated the news on television. "Thanks to my country, to my neighbors and to my family, who were supporting us," she said. Nationals general manager Mike Rizzo said they had not had direct contact with Ramos, but they were "thrilled" with the reports of his rescue. "We are eager to see Wilson and let him know just how many all over the world have been waiting for this news," he said. Armed men seized Ramos at gunpoint Wednesday night outside his home in a working-class neighborhood in the city of Valencia, setting off a nationwide search in a country hard hit by kidnappings. The family huddled with police, awaiting demands from the suspected kidnappers. Authorities said Thursday that they had found a stolen SUV used by the kidnappers abandoned in a nearby town. The abduction was the first known kidnapping of a major league baseball player in a country that has dozens of players on big league rosters in the U.S., and it brought a renewed focus on worsening violent crime in Venezuela. More than 1,000 people have been kidnapped in the country this year. Bodyguards typically shadow major leaguers when they return to their homeland to play in Venezuela's winter baseball league, but it was unclear what precautions, if any, Ramos was taking while at his family's home. Major League Baseball officials said it was the first kidnapping of a major leaguer that they could recall. Fans in both Venezuela and Washington had held candlelight vigils and prayed for his safe release.